The hot air ballooning safari season kicked off at Wilderness Safaris’ Vumbura Plains and Little Vumbura on the 1st of April. From now until 14 October 2018, guests will be able to experience this once-in-a-lifetime adventure which offers an unmatched bird’s-eye view of the pristine 60 000-hectare Vumbura Concession. 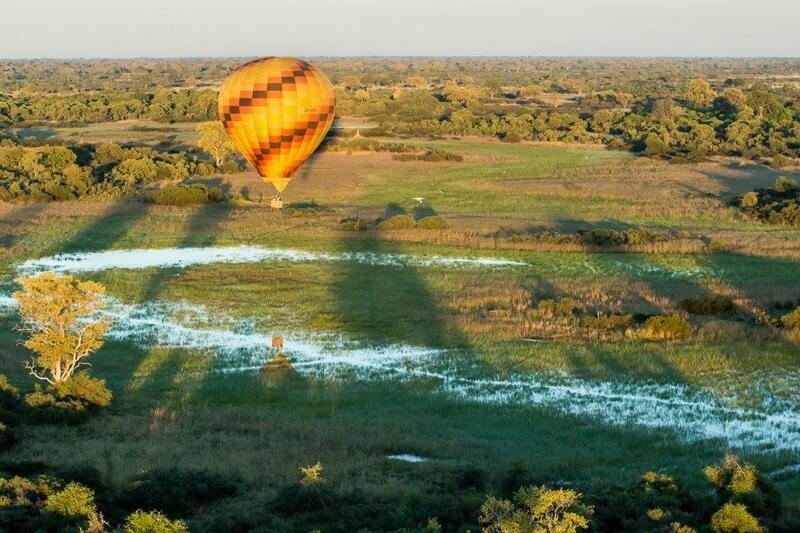 “A hot air balloon safari over our private concession is truly a bucket-list experience”, said Attorney Vasco, Wilderness Safaris Botswana Sales Manager. “It provides the ideal opportunity to fly over remote areas that are not often explored on game drives, allowing us panoramic views of untouched plains, interspersed with dry riverbeds and ancient island forests, and to view a range of wildlife from the air. On our very first flight of the season, our guests were treated to sightings of elephant, leopard, giraffe, serval, honey badger, tsessebe, wildebeest and kudu, to name a few”. A maximum of eight guests can enjoy a hot air balloon safari at any one time, ensuring a personalised journey. After approximately 45 minutes in the air, guests will be met with a celebratory glass of champagne upon landing, before returning to camp for a delicious brunch. “We also recommend that guests make this excursion a full “air safari” by choosing a scenic helicopter flight to or from the balloon launch site (or both)”, added Vasco. “This offers an additional opportunity to explore the waterways of the Delta in search of wetland species, like the secretive sitatunga and forgotten pods of hippo in remote areas”. The balloon safari and helicopter flights add to the diverse list of already-popular activities on offer at Vumbura, including mekoro (dug-out canoes), boating, game drives and nature walks – led by highly-skilled Wilderness Safaris guides. The Vumbura Concession comprises a varied mix of mopane, acacia woodland, floodplains and permanent swamp. Key mammal species include herds of elephant and buffalo, sable, zebra and wildebeest. Cheetah spotted hyaena, lion, leopard and wild dog can also be seen. Vumbura Plains comprises 14 rooms, and Little Vumbura is an intimate six-tented camp; both are perfect bases from which to explore this pristine wilderness area. The camps are also committed to Wilderness Safaris’ 4Cs ethos of Commerce, Community, Culture and Conservation. The Vumbura Concession is leased from five villages, through the Okavango Community Trust in a partnership that ensures that the benefits of ecotourism are shared with its neighbouring rural stakeholders – this forms part of Vumbura’s Purpose, which is ultimately tied in to Wilderness Safaris’ vision: To conserve and restore Africa’s wilderness and wildlife by creating life-changing journeys and inspiring positive action.